In the beginning Kayak More Tomorrow chose the Lofoten Islands for their surreal location. 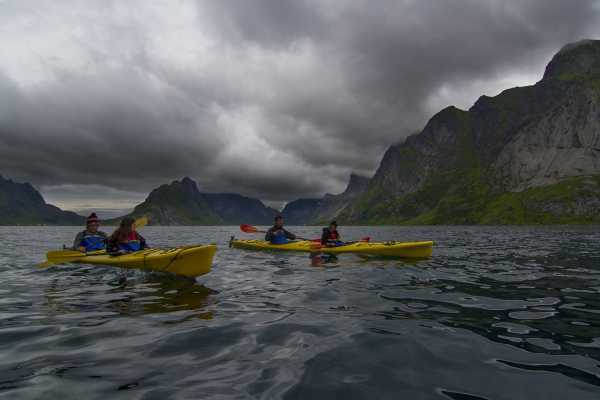 These majestic Islands were the perfect place to introduce Norway to adventure travelers; now some 20 years later our Lofoten Islands sea kayak expedition has become a classic in international sea kayaking destinations; a highly ranked bucket list trip. These impressively scenic islands form an archipelago, one hundred miles north of the Arctic Circle. It is a place of mystical landscapes illuminated by nearly continuous daylight. Glacially-carved, shear granite spires rise out of a sea made rich by the meeting of the warm Gulf Stream and the Arctic Ocean. The Islands are fringed with green pastureland and dotted with picturesque fishing villages each with its own unique character and dramatic mountain backdrop. This is a true Arctic kayaking adventure with the advantage of finishing every day with a hot shower and a warm bed. You’ll kayak the length of this remarkable chain of islands through indigo-blue fjords cutting between jagged peaks, stopping at white sand beaches and hiking to viewpoints for incredible panoramic vistas. At the end of each paddling day you’ll stay in “rorbuers”, traditional fishermen’s lodges with time to explore these charming villages and sample the local cuisine. Great kayaking, spectacular scenery and Norway’s seafaring culture make the Lofoten Islands one of the world’s great paddling trips. Kayak More Tomorrow's sea kayak specialists were the first to design and operate commercial sea kayak trips in the Lofoten Islands; no-one knows these waterways better than us, as KMT is without a doubt the sea kayak tour company with the most guiding days amongst these Arctic Islands. The best time to paddle in the Lofoten Islands are from late May through June, July, and August. KMT's Iconic Lofoten Islands Itinerary has been attempted copied my many, but no-one has been able to get it just right, so do yourself a favor and paddle with Lofoten's best sea kayak tour company. Contact us via e-mail at: office@kmtnorway.com and have our sea kayak trip designer tailor an Iconic Lofoten Islands trip for you. Please keep in mind that the earlier you send us your request the more likely it is that we can accommodate you. We are excited to paddle The Iconic Lofoten Islands with you! An Iconic itinerary designed by our world-class trip designer; we have guided over 2000 paddlers through these Magical Arctic Islands! We begin the day cruising through the islands of Valberg where we will discover a beautiful white sand beach, the perfect lunch stop. Our lunch break is timed with the approaching slack in Gimsøy sound. This is our last major crossing of our journey through Lofoten Islands. The route across will depend on the weather and sea state. Henningsvær seems to grow out of the sea as we approach. Sculpted rock peaks provide the perfect backdrop for this island village as we paddle down main- street Henningsvær we marvel at the splendour of this majestic town.